The New Southern Bus Terminal on Pinklao-Nakhon Chaisri Road (Boromratchchonnanee Road) offers a daily bus services on the Bangkok-Prachuab Khiri Khan route. Passengers can choose a first-class air conditioned bus or a second-class air conditioned bus. For more details, contact the New Southern Bus Terminal at Tel. 02434-7192 or 0-2435-1195. From Prachuab Khiri Khan Bus Terminal, you can continue on to the Park by hired motorcycle. Prachuab Khiri Khan, Tel. 0-3261-1175. The first route starts in Bangkok and takes the Thonburi-Pakthor Highway (Highway No. 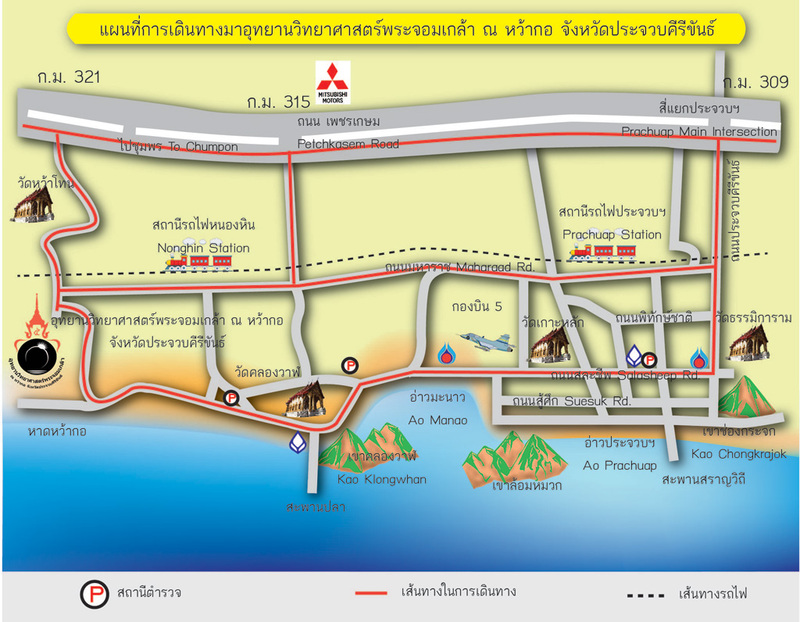 35) to pass through Samut Sakhorn and Samut Songkhram Provinces and turns left on to Phetchkasem Highway (Highway No. 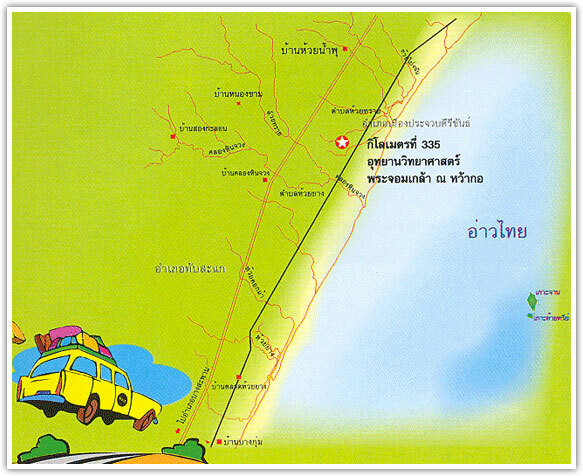 4) which passes through Phetchburi Province to enter Prachuab Khiri Khan Province. The second route starts in Bangkok and takes the Pinklao-Nakhon Chaisri Highway (Highway No. 4) through Phutthamonthon District, Nakhon Pathom, Ratchburi and Phetchburi Provinces to enter Prachuab Khiri Khan Province. In order to reach the King Mongkut's Science Park at Waghor, you have to drive southwards from the Prachuab Khiri Khan Intersection along the Phetchkasem Highway for approximately 16 kilometres until you reach the 335th Kilometre Post where you turn left into Ban Wahtone. Continue driving for approximately 3.5 kilometres and cross the railway to enter the Park. You can also start at the Prachuab Intersection and drive to the 323rd Kilometre Post before turning left towards Prachuab Khiri Khan City Centre. Drive along Salacheep Road to pass the 5th Aviation Group (the Manoa Bay) and the Coastal Fisheries Research and Development in Prachuab Khiri Khan (the Khlong Wan Intersection) before turning left into Khlong Wan Village. Continue driving until reaching the Park (the 5th Aviation Group-The Park Route, approximately 10 kilometres further on).